Watch this video to learn how to configure the Player Defaults tab in the Smart Podcast Player Settings menu. 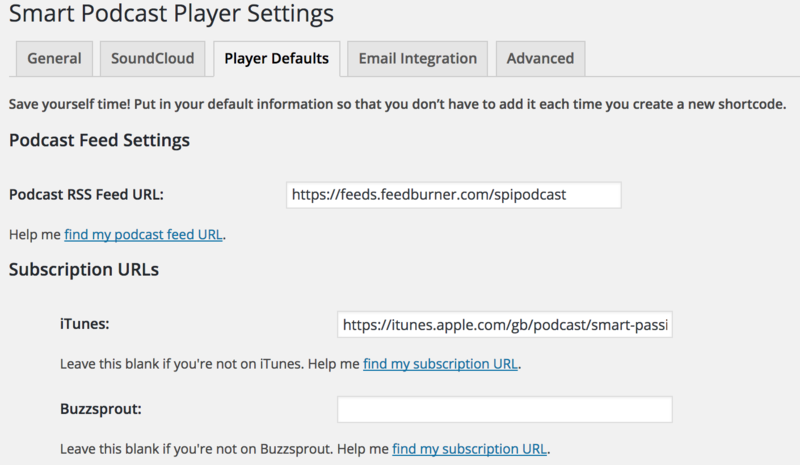 By filling our the Player Defaults section of the Smart Podcast Player Settings menu, you'll save time whenever you need to add in the full and track players. Go to Settings —> Smart Podcast Player. First, we’ll go to the box titled Podcast RSS Feed URL. This is where we will put in the RSS feed that we found in the previous lesson. Copy the entire URL for your podcast, including the http://, and paste it into the box here. Scroll down and click Save Changes for this to apply. The Subscription URL boxes sets the destination for the images in the Subscribe button (see the yellow box below). The Show Name box (for the full player) is optional. By default, the Smart Podcast Player and the Smart Track Player both display your episode title. 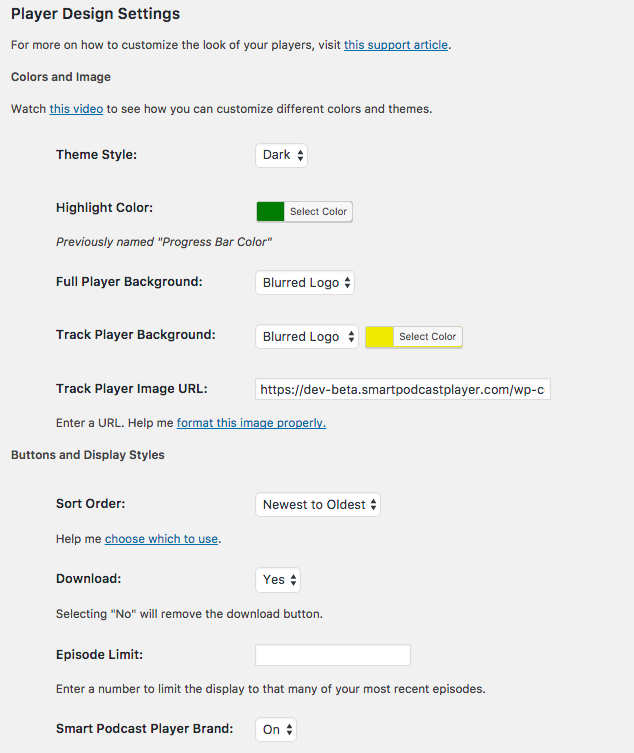 If you would also like to include your podcast’s name in the full player, add it into this box. You can also specify a custom Artist Name (for the track player) if you like. Now, let’s scroll down to Player Design Settings to look at the options that affect the color and style of your players. Highlight Color will apply color to the progress bar, as well as the play button and any hyperlinked URLs in your show notes. You can choose one of our six default colors or you can enter a hex color value of your choosing by clicking Select Color and entering the value here. Watch the video above for a full explanation of the background settings, particularly the Blurred Logo setting.The final element that controls your player’s coloring is the Theme Style chooser. 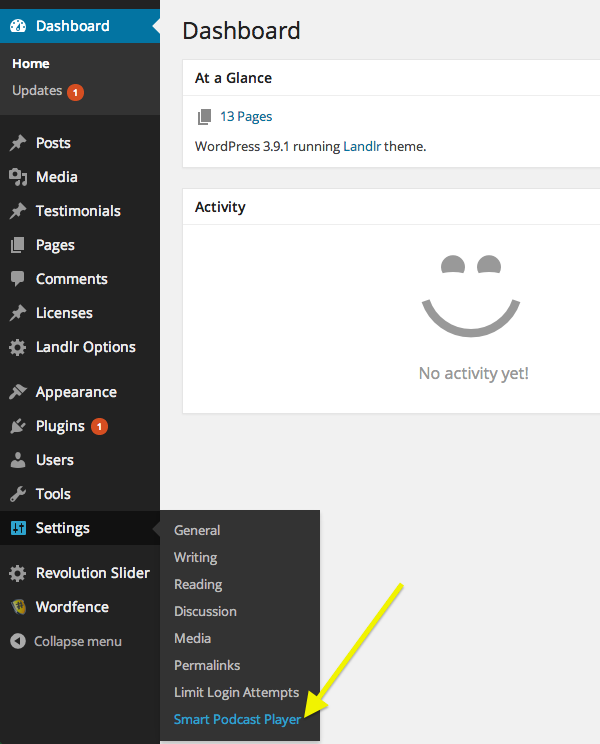 We have two themes, the Light theme and the Dark theme. Track Player Image URL lets you select an image to display in the track player. You'll need to enter a URL, which means the image needs to be hosted somewhere online. This list continues to grow, and so you may see new settings that appear here. 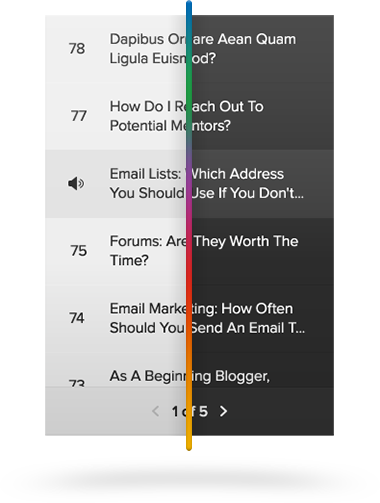 Setting the Sort Order affects the order that your tracks appear in the full Smart Podcast Player. The default setting is Newest to Oldest, which causes your most recent podcast to appear first. If you would rather than your listeners start with your first episode and listen in the order that you published episodes, switch this setting to Oldest to Newest. This is perfect if your podcast offers step-by-step advice. 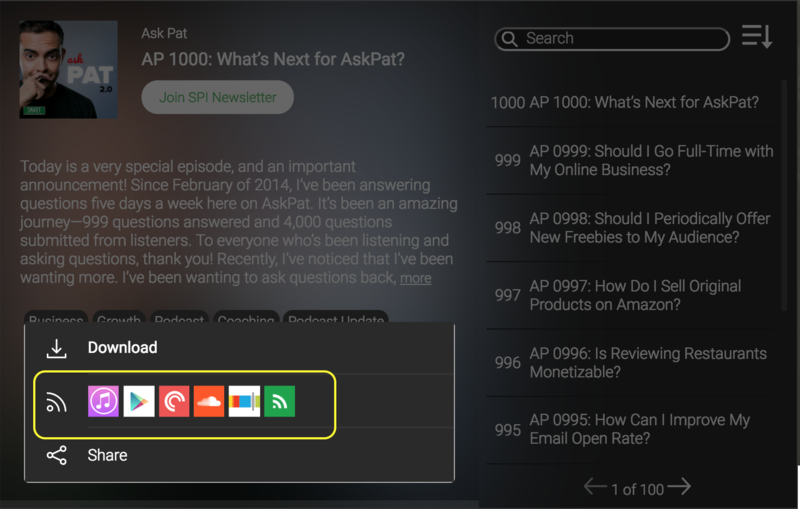 Download lets you select whether your listeners can download your episodes from the full player or the track player. When you are finished, click Save Changes to apply your settings. You may notice that I have skipped over the Advanced tab. Leave these settings as they are, unless you find that you are experiencing problems loading the player. You can read more about these settings in the Adjusting advanced settings article.